A culinary dream came true. And therefore first thing… I got to thank my parents who generously invited us for dinner. This is a birthday present which will last an eternity since they allowed us to have a dinner at the most talked about restaurant of the globe. The reservation of course had to be taken far in advance in September for a table in August; thus it was quite a long wait with enough time to build up high expectations. Will they be fulfilled? Here’s my report of an unforgettable evening. It was a nice start. One of the many service crew members welcomed us and instantly walked us to the kitchen; let us shake hands with a very charming, always smiling Ferran Adria. 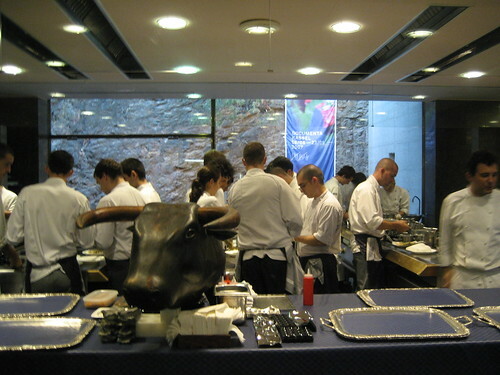 Behind him, some 40 cooks were in the preparations for the evening, washing, peeling and cutting ingredients. We took some pictures. 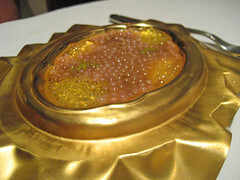 Ferran Adria threw goodbye kisses to us and we went back to our table on the terrace where we awaited the first creation of the master! And it was a whole avalanche of courses coming down on us. 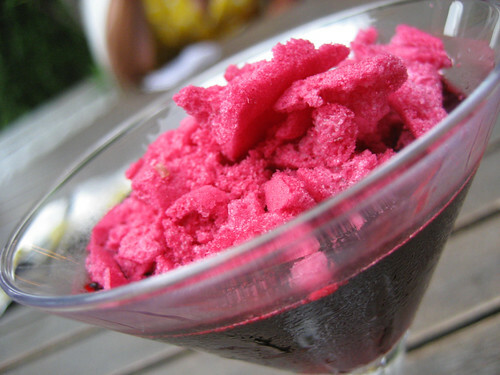 We started with a very tasty hibiscus flower margarita, which was a purple acidic drink topped with light flocks of hibiscus powder I guess. At the same time we were being served the “El Bulli snacks”, composed of spherical olives (filled with olive juice, a really intense olive taste which I liked a lot), golden nuggets, beetroot and yoghurt meringue (also very nice), salty chocolates, nori leaves with sesame (kind of banal) and parmesan airbag. Now we were asked to take place in the inside of the restaurant were the first starters followed; still small and handy portions but a little more elaborate than the “snacks”. 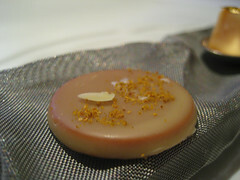 The tangerine bonbons with peanut and curry had a nice “peanut-sweet” and salty taste which went perfectly with my glass of Manzanilla. 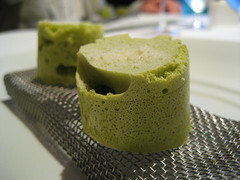 Then the pistachio sponge cake with acid milk mousse didn’t bring much taste but was a nice neutralizer: maybe it also was its purpose? (The explanation of the sense of each dish was maybe something that was missing). 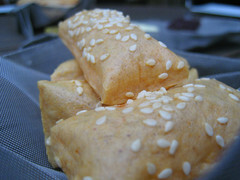 One of my favourites came now: the sesame sponge cake with miso. 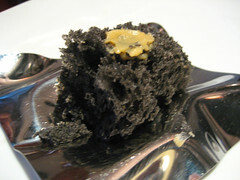 It looked like a black sponge with a small dot of miso crème on top. 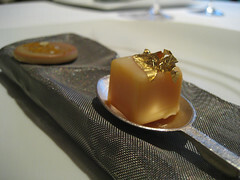 It was a perfect trick since the black sponge actually tasted like brioche and was a nice combination with the miso! 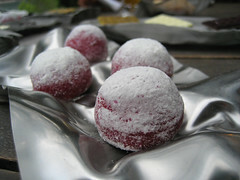 Raspberry fondant with raspberry vinegar was again a nice neutralizer, more fruity and acidic though. 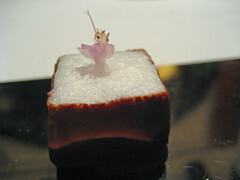 The shape of the fondant was really beautiful and reminded a raspberry. 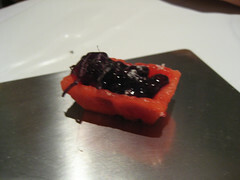 Watermelon with blackberries caviar was refreshing. 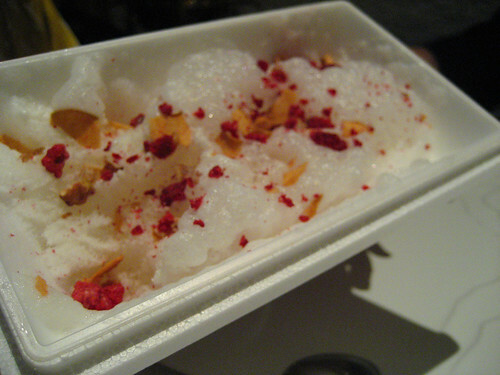 It was a small container made of frozen watermelon filled with little blackberry balls. We had to eat it fast before it melted. 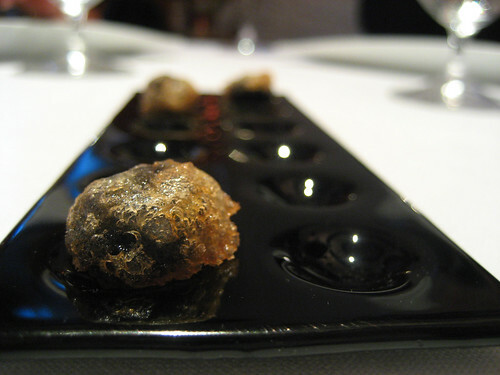 Then Mejillones were served with 3 dots of different kind of powders. One was lemon; one was fennel and the third? Hmm..can’t remember the third one but I liked fennel most anyway. 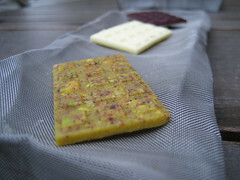 Next were Pistachios with its honey and Roquefort. 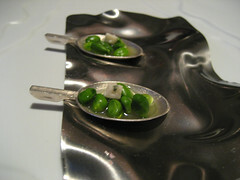 They came on a small spoon and looked like small peas. Nice combination. Haricot bean with Joselito’s Iberian pork fat wasn’t a unanimous winner. 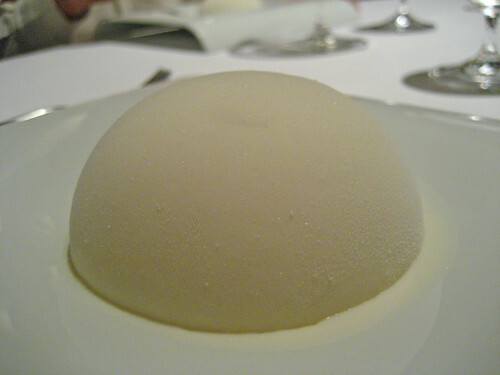 It had the shape of a giant bean and was filled with some kind of bean cream. It taste quite hearty and good but some thought it didn’t look very appetizing. What do you think? 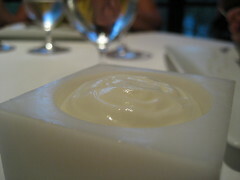 Then came oysters yoghurt with PX in tempura. 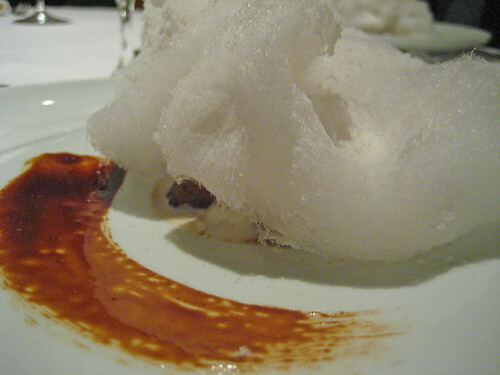 The PX in Tempura is liquid Pedro Ximenez sweet wine in tempura batter which one had to eat in combination with the warm oyster yoghurt soup in the glass. 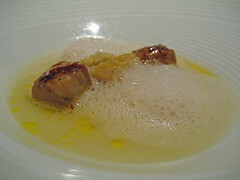 The oyster soup had a natural oyster taste, but wasn’t my thing really. 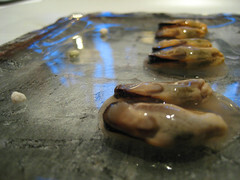 I have to admit that I’m not a big oyster eater, and I’d rather have them fleshy with shallots and vinegar. On the other hand the PX in Tempura was delicious. Then there was anchovy and ham with yoghurt yuba. 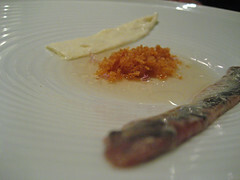 Anchovies are a specialty from Rosas, so this represented the superlocal touch of the whole menu I guess. As for the taste: fresh and good of course. 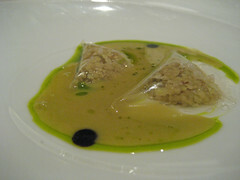 Parmesan frozen air with muesli was a fish substitute for my mom. It came in a big Styrofoam box reminding fast food packaging or a big ice-cream box. Inside was really light foam with intense parmesan taste. It really was like air. Funny interlude. 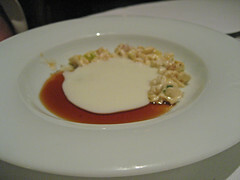 Gorgonzola shell, walnut celery and apple was a true beauty. 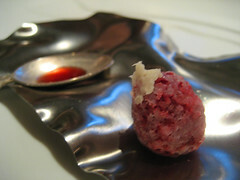 The frozen gorgonzola shell cracked open like an egg when hit with a spoon and the other ingredients were hidden inside. The combination of gorgonzola with apple and nuts is a true classic and the addition of celery and the cold of the gorgonzola added a true freshness. A really fantastic dish, a reinvented classic. Tomato couscous with oil olives basil and parmesan cheese was again a beauty, a true colour explosion. 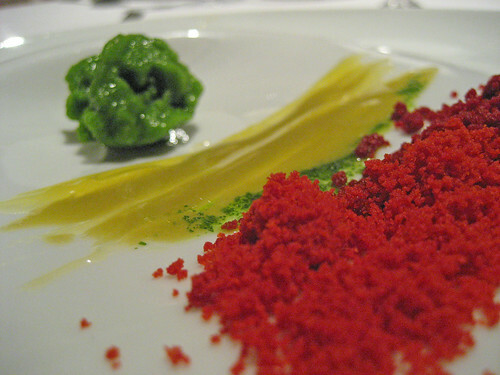 The tomato couscous was a very intense and crunchy powder with tomato taste and the basil came as ice-cream. It was spicy and refreshing, Mediterranean and Oriental. Superb combination! Excellent! 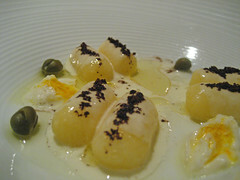 Gnocchi of polenta with coffe and safran yuba, were tender and creamy but definetly not one of the highlights of the menu. 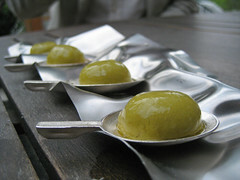 The Padron ravioli were transparent ravioli filled with seeds of the Spanish Padron-pepper. Maybe a reinvention of a typical Spanish tapas-bar dish. It wasn’t one of my favorites but undeniably had an ironic edge to it! The Navajas with seaweeds were served cold. 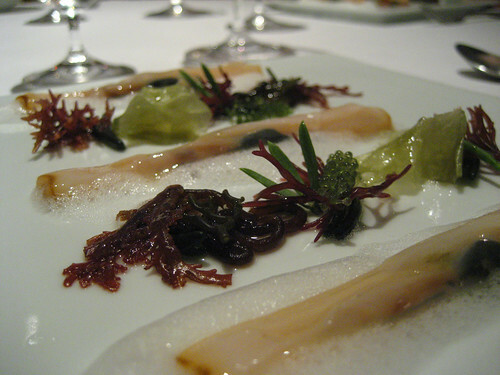 The seaweeds were crunchy, the navajas fleshy, but I preferred them warm a day before at Can Rafa in Rosas (report coming soon). Next, Fresh Walnuts, The next one I’m not sure anymore what it was, maybe someone could help me? 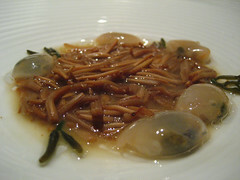 Then came garlic with coco (the black garlic clove was cooked, Japanese style and had a teriyaki taste), Then snails a la llauna which were apparently snail eggs but evidently played on the resemblance with caviar. 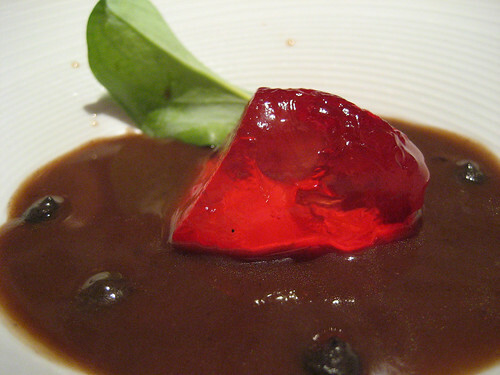 Hare juice was a very tasty sauce or reduction of hare meat with a fruity gelatine inside. This was practically our first meat dish; nothing to bite into, but still tasty. 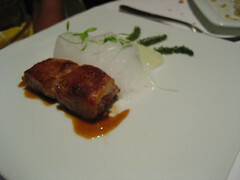 My mom (who doesn’t eat any fish) had another meat course which was lamb tail with yoghurt Cantonese style. I tried it and it was very tender lamb pieces in a refreshing yoghurt sauce. 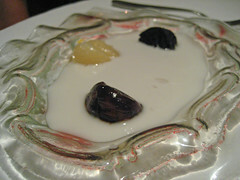 The meat had this typical Cantonese flavor but the yoghurt was rather a tribute to Indian cooking for me. 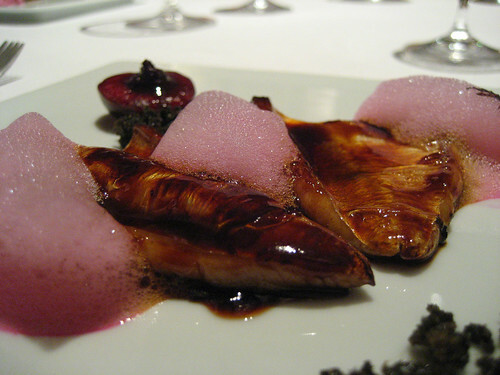 This was the eel course: it was at the same time beautiful and tasty, but I don’t remember the exact name. 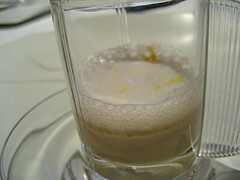 This picture shows the wool 2007, and I really can’t remember how it tasted, but it definitely looks interesting. There were so many interesting and surprising dishes until now, that my brain only memorized the most distinctive from now on. The Trufitas were also a surprising dish. One waiter brought a tablet which was filled with a powder like ingredient. It was maltose. 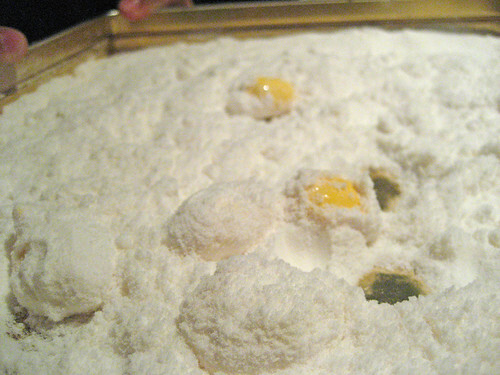 Here and there inside this maltose sandbox were hidden soft tamarind candies. And it tasted very good too: a sweet maltose outside and a fruity acidic inside with a creamy consistency. Finally, there were these 3 desserts. The first one was called Albarizas and represented a vine planted on the white albariza soil of Jerez. Very beautiful isn’t it? But here again, can’t remember the taste really! 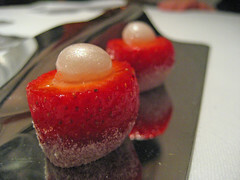 The next 2 desserts were called morphings and were not only nice eye-candy, but also yummy. The meal has ended now and we are finishing our Pedro Ximenez glasses and had finally a moment to relax and to assort our thoughts and feelings. We had gone through one of the most creative and surprising dinners in our lives and it was time to ask ourselves if we were totally satisfied. The Food was flawless, but a feeling of full satisfaction wouldn’t come up! And if it wasn’t due to the food then it must be the way it was served. I am sure that the cooking style of Mr. Adria only permits a very precise logistic, since every dish has to be prepared a la minute in a certain way and then the service crew has to run it to your table before it melts or vaporizes somehow. This creates an incredible fast pace. Such a fast pace that you couldn’t relax in between the courses. Such a fast pace that you felt like being on an assembly line at a factory, a victim of Taylorism (Such that I couldn’t remember some courses! 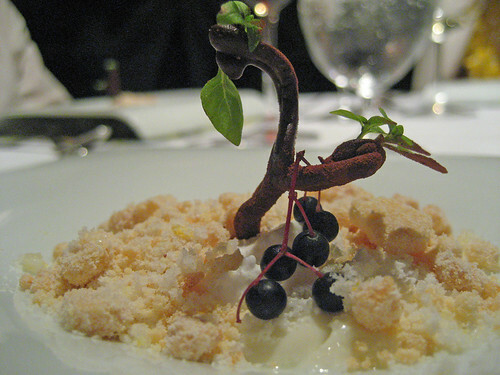 It is only now that I write this post that I realize how stunning all these courses were). Usually, in a restaurant were you qualify the service as being excellent, it is such that the guest must have the feeling that he sets the pace of the menu. Here it was the other way round. You felt like a pressure to eat fast because soon the crew would throw the next course under your nose. Furthermore the whole pace also translated through a very stressed and nervous service crew. Hard to find a smile in ones face, hard to transmit honest friendliness under such stress conditions I guess. 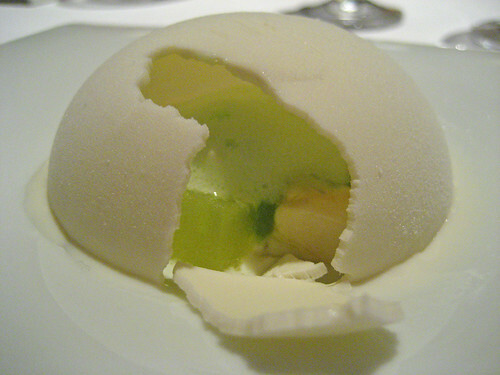 And sometimes this stress nearly felt like rudeness: Sometimes the explanation of the dishes came so fast and in such a severe tone that it felt like a military command -“ok, this is spherical olive, ok, eat in one bite ok!”, is just one example. I understand that all these waiters weren’t native English speakers, but I didn’t expect perfect English but at least friendliness or engagement. Plus, there were so many waiters running around, standing around, and staring at you all the time that one had the feeling to be observed permanently. I would be interested to read other opinions about the pace of the service and the service in general. Is this a 3 star restaurant without 3 star service? Thanks Barry. Your post is really a good complement! thanks for the report and the nice pictures. Despite the hectic service I would still love to eat at El Bullí some day.